This bread is something that I tried when I was a teenager and have loved ever since. I have not had it for many many years, and I always thought it would be daunting to try making it. It just looked so difficult. One of the vegan cooking groups that I belong to on Facebook (Australian Vegan Foodies) has a weekly theme. All the members get to vote on a theme and the winner theme is announced on Sunday. It is just a bit of fun but I always like to make something from the theme. This week's theme was right up my alley, "Baked goods". I love love love looooooove baking. So I decided to finally give challah a go. I went in search of a recipe, and having just been given a bread maker by my mum (she gave me her old one), I went in search of a recipe for the breadmaker. I found this one, and set on veganising it. I usually write down all the ingredients and then note my substitutions. I like to weigh everything if cup measurements are used, given that there is a difference between imperial and metric cup measurements. In my excitement I dumped the flour into the bowl without taking note if I had pressed "tare" on the scales or not. There would be a 90gm difference in the recipe if I had not pressed it. I thought that it would not be a problem, so I weighed the same cup amounts of another flour. The weight was more than 90gms off, which told me, that I had not measured the ingredients correctly. So today I went back to the drawing board, made the recipe slowly and made a few more substitutions. The dough is kneading in the breadmaker at this very moment. The bread maker takes 30 minutes to mix and knead the dough, and another hour to rise. I have listed the ingredients below in metric cups and grams. The metric cup is 250mls. The tablespoon I used, is a 15ml one, if you have a 20ml tablespoon, then you can use 3 x 1 tsp for each tablespoon, as one teaspoon is 5mls. I hope that is not too confusing. The recipe is very straight forward. NOTE: In my previous attempt, I used vegan margarine instead of oil. I also used kala namak, to get an eggy flavour, and did not use the bread improver. The bread improver made a huge difference, and the dough rose to double the amount than it did yesterday. Today I used the tumeric to give the bread the yellowy colour it would normally get from the egg yolks. I cannot taste it. 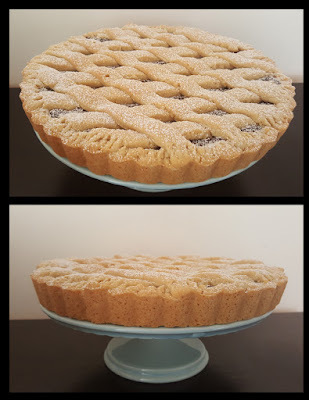 I just wanted to add a note about a couple of ingredients and some common questions that have come out after posting this recipe in the Vegan Meringue - Hits and Misses Facebook Group. Bread Improver - is a mix of various acids and enzymes that serve to strengthen the gluten in the flour and feed the yeast, both of which yield a better loaf. (Source: Seasoned Advice). Here is an article on Wikipeadia that give you more information. I just wanted to say that I have read in places where people say that bread improver is not required, and its just a gimmick. I can tell you from the experience of making two versions of this bread, only one day apart, that bread improver IS NOT A GIMMICK. It certainly makes a difference to the dough. The volume of the dough was at least double once risen, the bread once cooked was at least half as big, and the texture was so much better. Here is the link a home made improver recipe. I have removed the links to the bread improvers online as one of the readers from the USA called the US company that sells the bread improver, and it is not vegan. Erring on the side of caution, I will just leave the link to the home made bread improver. This is a recipe online for a natural bread improver. I will give this a try next time I make this bread. Here is the link to the recipe. Please note that this is an optional ingredient. The purpose of it is to give the dough a bit of an egg flavour given that this egg is traditionally made with eggs. A word of warning, once this salt is wet it will give an awful smell, I found it stuck to my nostrils for hours!!! I would not recommend trying it, as when i did, the taste was in my mouth for about a day! I have seen this type of salt added to scrambled tofu to give the egg flavour. No Bread Maker - Many people have asked me about making the dough for this bread without a bread maker. I have not had much success in doing this, but then I am not very good a kneading at all. I have heard of people having great success in kneading bread with a stand mixer. I found this article which has some tips on converting a bread machine recipe to be done by hand or stand mixer. Let me know if you try it and it works. Bread Improver - I have made two more batches of this challah since this recipe was published. I used the home made bread improver. I did not have any lecithin granules. I read in another recipe that the baker used psyllium husk to improve the bread. I used that instead. I blend the husk in a coffee grinder so that it is like a powder. All the ingredients suggested by the recipe are sifted with the flour prior to adding them to the bread maker. Unfortunately, it seems that the website that I keep linking for the bread improver recipe is down, and has been down for some weeks. I have been able to find an amended recipe in one of my other dough recipes, which I will post here. 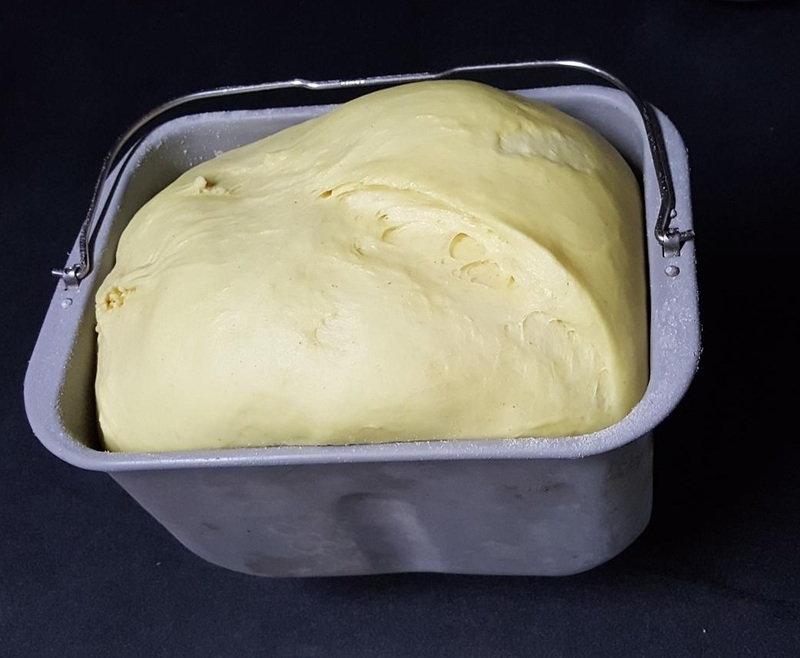 I have made a big batch of this bread improver and stored it in an air-tight container to use in all my bread or dough recipes. Place the ingredients into the bread maker in the order listed above. Set your bread maker to dough setting and wait until completed. Take the dough out of your bread maker and place on a well floured surface. Divide the dough into even pieces. You can divide the dough in as many pieces as you want to braid. 3, 4 5, 6. I decided to try 8 for this one, but the process is exactly the same as if you're doing 6. 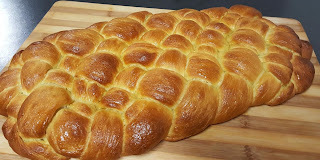 Place the finished plait on your tray and put in a warm spot to rise for 30 minutes. Make your glaze and brush your bread all over. Place in the oven and lower your oven to 190 C (374 F) and bake for 30 minutes. If you find that your bread is browning too quickly, lower your oven to 180C (350F). Remove from the oven and set aside on a cake rack to cool down. Mix together until combined and use to brush on the bread. 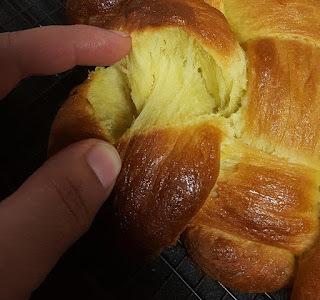 I recorded the whole braiding process on video, but because I could not see what I was doing, when I played the video, my arm is covering the whole part of the braiding, so it can't be seen. Here is a link to another YouTube video that has some really lovely braiding techniques. I don't have a bread maker,can I bake it in the oven? If so what temperature? I believe she used the oven - she used the breadmaker just to mix it up. Kelly, thank you and you're welcome!! !